Sluggers is located in the Wrigleyville neighborhood of Chicago. Normally, it's a sports bar; they support the Cubs and Blackhawks in particular. But twice a week, on Friday and Saturday nights, it takes on a new dimension. This is when it hosts the dueling pianos. In addition to the big weekend nights, dueling pianos also play after all Chicago Cubs home games. The music is always upstairs on the second level. The roster of piano players rotates, and they are all accomplished in a variety of styles - top 40 music, old rock 'n'roll, school songs, team fight songs, and more. The bar provides a calendar on the website, so you can see who will be playing in advance. 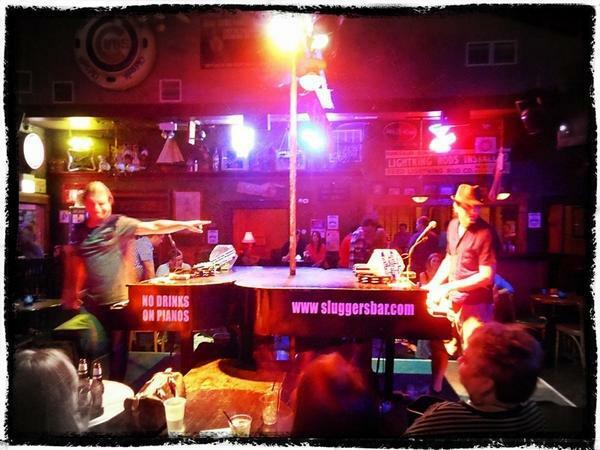 Dueling piano nights are crowd-pleasing events, and the ones at Sluggers are no exception. Audience participation is an important, and encouraged, part of these nights. The piano players take requests from patrons. Additionally, there is a dancers' pole between the pianos. People are able to climb up and dance on the pianos, if they're brave enough to do it. 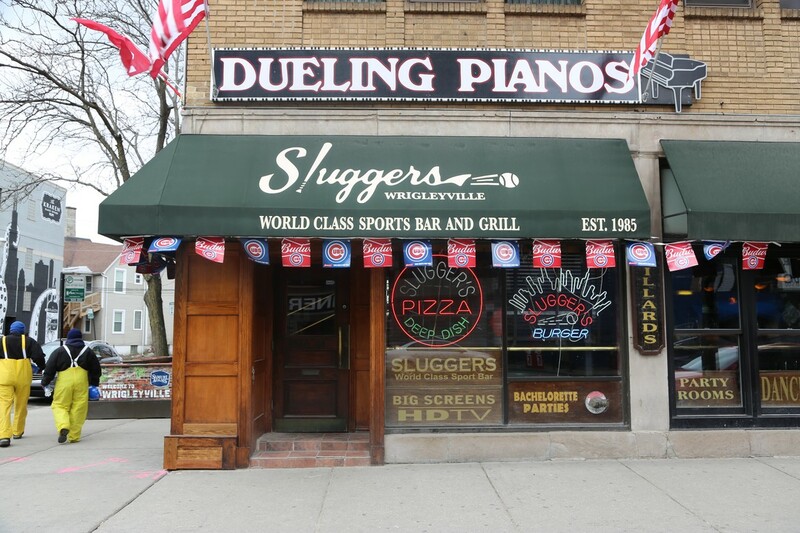 Sluggers advertises that it is the only dueling piano bar in the world to have this option! The clientele comes from all walks of life: from blue-collar workers to college kids, everyone is welcome at Sluggers. Well, everyone who likes the Cubs, at least. Although there is no cover charge for the bar itself, there is one for the dueling pianos events. The cover charge is also subject to change, so it's best to have a look at the Sluggers website, or call ahead for more information. Sluggers World Class Sports Bar is devoted to serving the crowd in the neighborhood, but they also are available for private events. Whether you're into sports, music, or both, Sluggers is a unique good-time venue that's well worth a visit. Just as good as our authentic Buffalo Wings, but without the bone. Loaded with Bacon, Cheddar and Monterey Jack Cheese. Served with Sour Cream. Corn Tortilla Chips topped with Refried Beans, 2 Cheeses, Lettuce, Tomato, Sour Cream and Salsa. 7 Breaded Mozzarella Sticks. Served with Marinara Sauce. 21 Baby Shrimp Breaded and Deep-Fried. Served with Cocktail Sauce and Lemon. Breaded and Deep-Fried. Served with Bar-B-Q Sauce. Our Pizzas are Made From Scratch with the Freshest Ingredients Available: Whole Plum Tomatoes, High Quality Mozzarella, Lean Meats, Fine Herbs. Please Allow 25 to 30 Minutes. Extra Ingredients: Cheese, Sausage, Mushroom, Onion, Green Peppers, Pepperoni, Fresh Tomato, Bacon, Jalapeno, Ground Beef, Sliced Beef. Our burgers are freshly ground, served on a Fresh Bakery Bun and include Fries and Cole Slaw, plus our condiment bar. Served plain, cooked to perfection. Topped with American, Cheddar, Jack, Mozzarella or Swiss Cheese. Pan-Fried in our Special Cajun Spices. Served with Tangy 1,000 Island Dressing on the side. Topped with 2 slices of Bacon and Wisconsin Cheddar. All Sandwiches served with Fries, Cole Slaw, and our Condiment Bar. 100% Ground Turkey delicately seasoned, served with Fries, Cole Slaw and Fruit Garnish. 6 oz. Boneless Breast Char-Broiled and drenched in our own Bar-B-Que Sauce. Whole Wheat Pita filled with Chicken Salad Garnished with Fresh Fruit. Grilled Breast of Chicken wrapped with Romaine Lettuce, Tomatoes, Parmesan Cheese & Caeser Dressing. Served with Fruit Garnish, Cole Slaw and French Fries.